An eclectic collection of thrifted, church sale and garage sale finds this month. 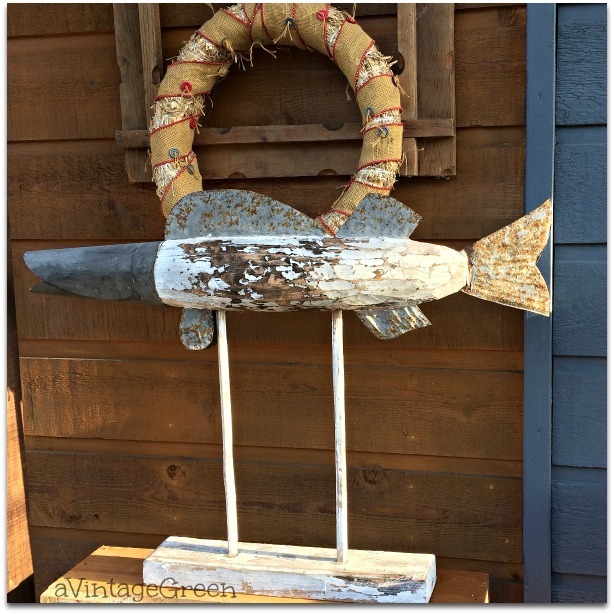 A find from the past - folk art hand carved wood and cut tin fish on hand carved supports on base. Totally in love with it. The primitive wooden frame and straw/burlap and buttons wreath finished the grouping. Remember the sheets? 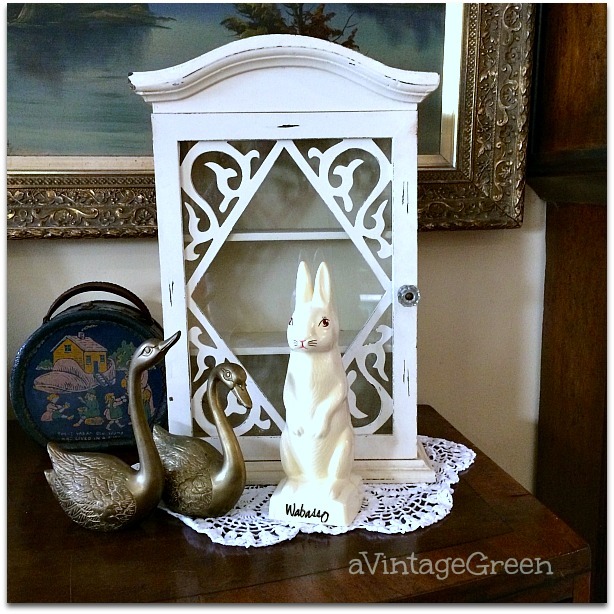 Wabasso Rabbit Bank and two brass swans. 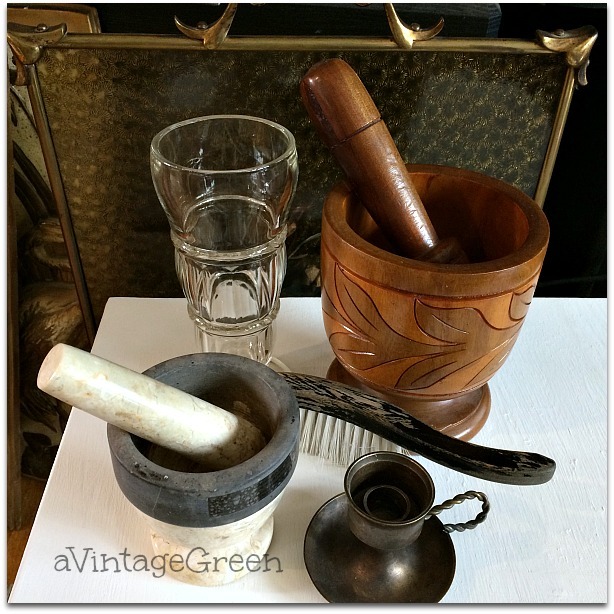 Vintage Sundae glass, vintage clothes brush, brass candle holder, large turned and a carved wooden and marble pestle and mortars. 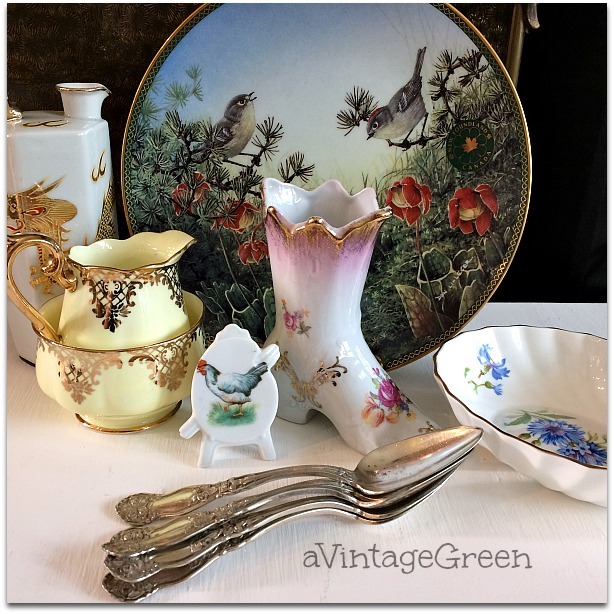 Decorator plate, cream and sugar, vintage decorator boot, small toothpick holder with rooster transfer, candy dish and silver plate spoons. 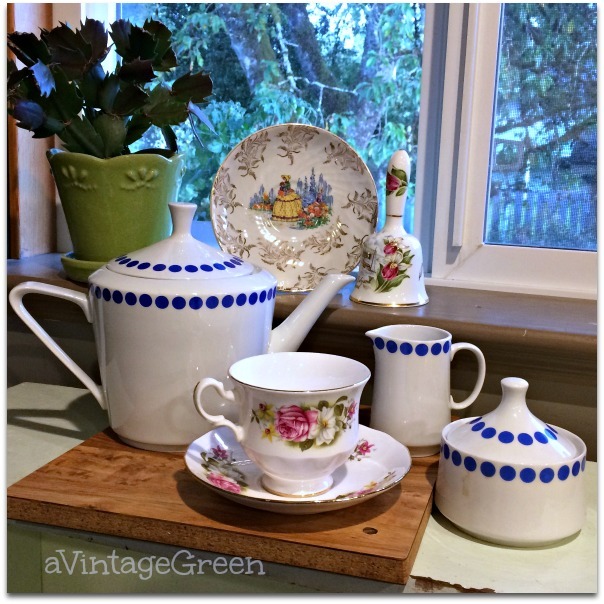 Northland Blue Dot teapot, cream and sugar, PEI bell and a Queen Anne teacup/saucer. The Lady in Yellow saucer is unmarked but the pattern is familiar. 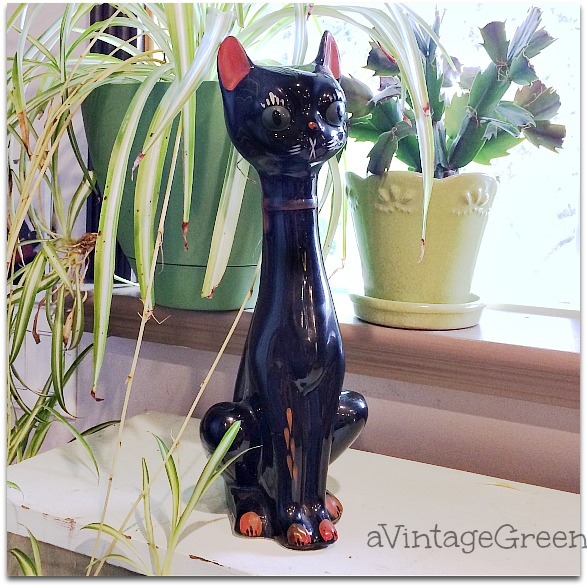 Vintage Japan, long necked black cat with pink ears and toes - cold painted. 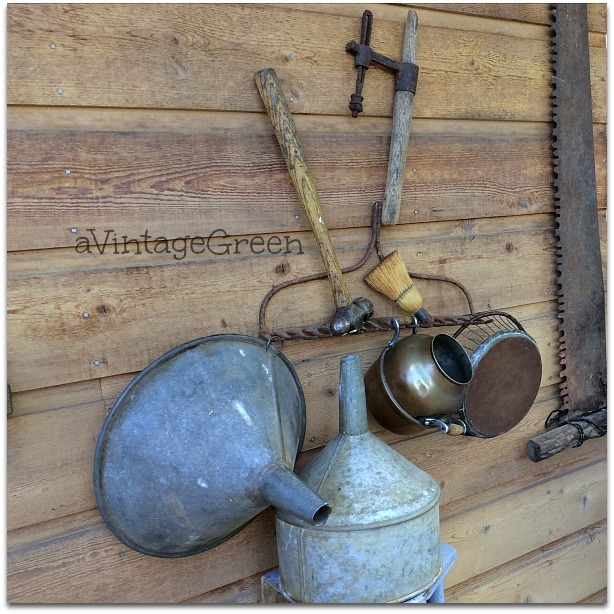 I love tin and copper, vintage metal well used tools. 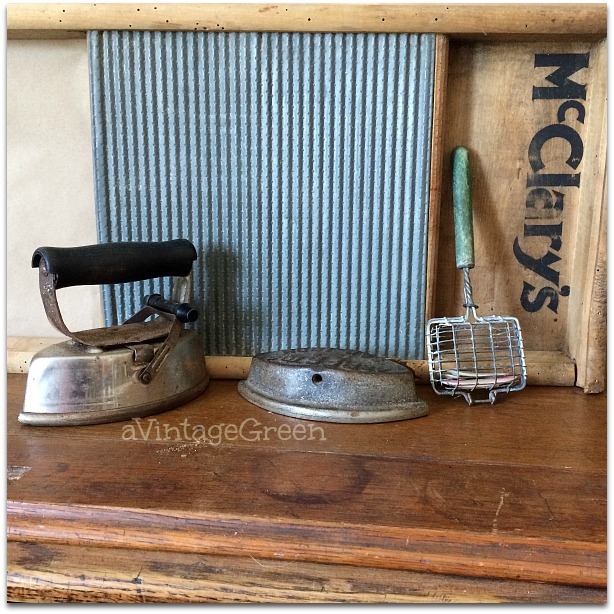 The washboard is from my own collection and the very heavy asbestos irons from garage sale finds. I love the green handled soap saver (and I remember my Grandma having one). I needed to make a LAUNDRY sign. 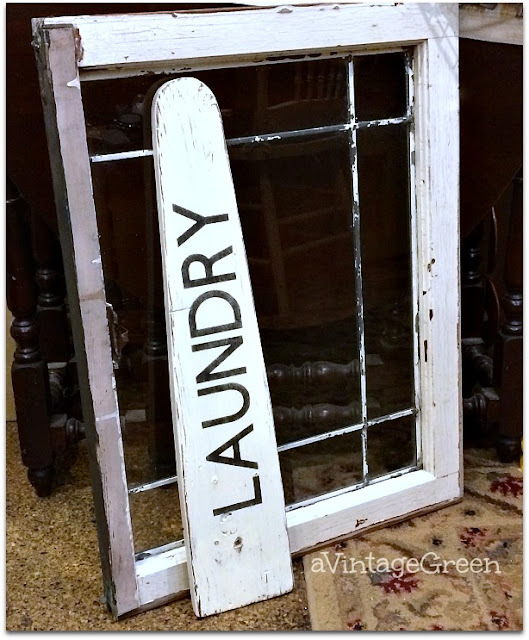 Used a piece of wood picked up at an estate sale some time ago and painted it CeCe Caldwell Simple White, made the word LAUNDRY on my Cricut (getting better with practice), stenciled, sanded and waxed. Check back here for an earlier larger Laundry sign. This time I tried a piece of red scrapbook paper for the paper stencil (I have been using letter sized cardstock previously) and I am pleased with the results - less messing around and trying to fit the letters on the 8 x 11 inch paper, the 12 x 12 inches worked well. The sequence of making the Laundry sign is below. The board shape is somewhat like a sleeve ironing board shape, seemed appropriate. 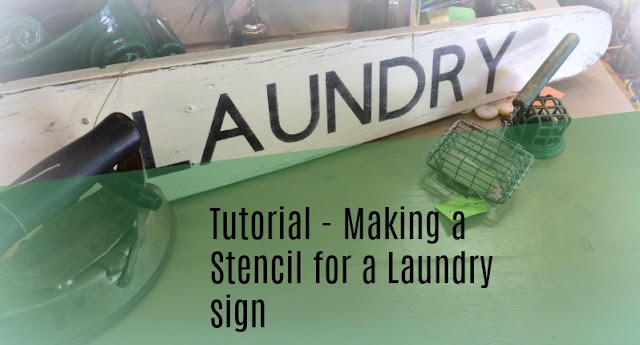 Used supplies on hand to make the Laundry sign. Filled in the 'sliced' letters with a fine tip brush and black paint. A thrifting bonus this month was several pieces of packaged and in great shape 12 x 12 scrapbook cardstock - at 60% off at the thrift store. More stencils will be made. 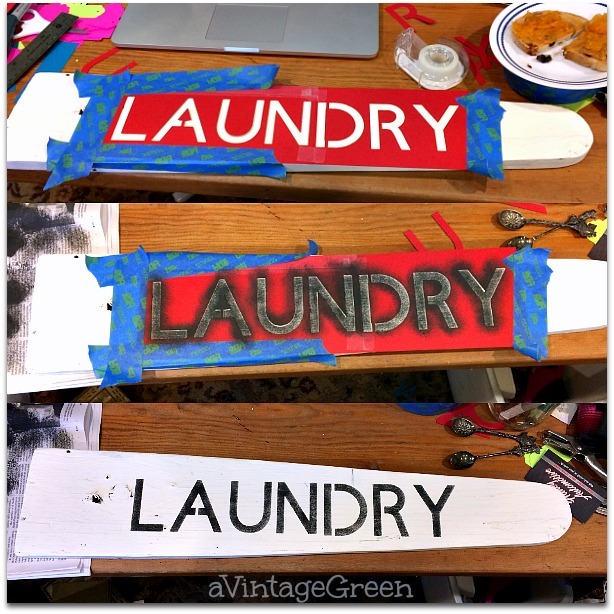 Great finds and love your re-purposed laundry sign! Gosh, Joy, you have some terrific finds there! That folk art catfish is outstanding! And I spy the Little Old Woman child's tote with the rabbit and swans - I collect those little totes as part of my vintage purse collection (I have that one, along with a couple more with other nursery tales on them). Your project is cool too. August was a good month! Great.My favorites are the fourth and fifth pictures!Love them,Hugs. Wonderful finds, Joy! Thank you for sharing @Vintage Charm--pinned! Joy - my favorite is definitely the cat - so classy! I tell you if I lived near to you I'd be forever stopping by and adding some of your great finds to my home, this month the tin fish and glass sundae dish would be coming home with me for sure. Clever to use the scrapbook paper as a stencilling template and what a bargain it was, no wonder you were happy dancing. Great to have you back with me for MM again this week. Some great finds Joy! That fish is pretty amazing and I love the old tools too! I'd have a big collection of those if I had the space, but I love looking at them. Thanks for sharing with us this week! What wonderful finds! Love that cat! Are you able to sell decorative plates? Just wondering b/c they won't sell at all for me in my Etsy shop. Love the laundry sign too & you're right that looks just like an old ironing board. That mortar & pestle is gorgeous. You really scored on all that stuff! As you can tell, I'm a vintage person too. Thanks for sharing this week at Sweet Inspiration! I love your treasures. The fish is my favorite although I am partial to the laundry sign. I throughly enjoyed shopping through your eyes. Some great treasures you found and I love the laundry sign. Thanks for sharing this with us at the Waste Not Wednesday link Party. Looking forward to seeing you back this week.